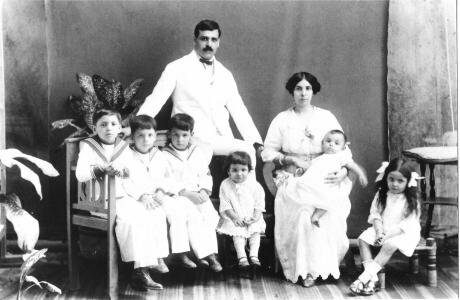 Aristides and Angelina de Sousa Mendes with their first six children, 1917. Wikimedia Commons. Public Domain. There´s always a little light shining through. Even in times of darkness. These little lights have saved thousands, hundreds, dozens of lives. Their reflection has shaped the lives of individuals, families and entire generations. We forget – too often – that for the darkness to recede the light must advance. That for evil to be defeated someone must oppose it. Aristides de Sousa Mendes was one of those brave men and women that did oppose it. He didn´t have to. He could had stood idly by as refugees were persecuted throughout Europe, in desperate need for help. But instead he extended his arm. Against his government. In detriment of his family interests, his country's diplomatic ties and his professional future. He decided to put his conscience over his orders, issuing visas for approximately thirty thousand refugees, who were able to escape persecution through Portugal. For evil to be defeated someone must oppose it. Aristides was born on July 19, 1885 to a devoutly Catholic family. After studying law, he soon joined the diplomatic corps, being appointed in 1929 as consul in Antwerp, where he lived for almost ten years. However, in 1938 his live would change forever, as he was appointed as the Portuguese consul-general in Bordeaux. Portugal lived then under the dictatorship of Antonio de Oliveira Salazar, and the country´s geographic position made it an escape route for those fleeing the Nazi regime. With the invasion of Poland – and as Portugal declared its neutrality – the number of refugees in transit grew exponentially, making it necessary for the Portuguese government to act. The regime issued Circular Fourteen –an infamous document addressed to all its diplomats – to deny safe haven to the stateless, Russian and German citizens and the Jews without an express authorization from the Minister of Foreign Affairs. The measure was not unique to Portugal and was mainly established to protect the country´s economic interests and reduce mass immigration. However, the discriminatory Circular made it extremely difficult for fleeing refugees to find safe harbour in Portugal. Aristides de Sousa Mendes choose to ignore the circular. He believed he could not act in any other way. The measure was both inhumane and unconstitutional, as the Portuguese Constitution stated that no one could be discriminated against on political or religious grounds. Aristides didn’t know that a systematized persecution of Jews and other minorities was taking place under the Nazis. But he did know – his brother was consul in Warsaw – that atrocities were occuring. As a faithful Christian, he felt that the only way he could act was according to his conscience. And his conscience told him that he had to help those fleeing persecution. So, he disobeyed his order and started issuing Portuguese forbidden visas on November 1939. The situation escalated in June 1940, when Aristides befriended Chaim Kruger – a Jewish rabbi – who escaped with his family to Bordeaux. As the Nazis advanced throughout France, Aristides offered him and his family Portuguese visas. The rabbi, however, refused, unless the offer was extended to all Jewish refugees wandering through the streets of Bordeaux. His decision forced Aristides to choose between his career and his principles. He chose the latter. From then on there were no more nationalities, races nor religions. He has giving everyone visas to escape. From then on there were no more nationalities, races nor religions. He has giving everyone visas to escape. Aristides actions were not well received in Lisbon. The Spanish and German authorities complained to Salazar about his behaviour – which arguably undermined the regime´s diplomatic relationships – while several of his superiors denounced his irregular issuing of visas. Finally, Salazar recalled him home. The Angel of Bordeaux, as he would after be named, took his time. He arrived to Lisbon on July 8, 1940, issuing visas on his way back home. Upon arrival he was immediately subjected to a disciplinary proceeding. He was accused of disobeying orders and infringing Circular 14. Despite recommendation to demote him, Salazar decided to suspend and cut by half his pay for a year. Only then was he 'retired'. His family – fifteen children and his wife – was blacklisted. Disgraced. Most of his children emigrated. Aristides himself would die in poverty in 1954. His actions unknown in his own country. The regime, however capitalized on his actions. After the end of the war, Salazar tried to make Aristides bravery his own. Portugal´s image as a safe haven for refugees was then established. However, it had nothing to do with the regime. On the contrary, it was established despite of it. At a time when many politicians and diplomats were cowards, Aristides was a true hero. However, his country failed to recognize it until 1987, when he was awarded the Order of Liberty and, one year later, symbolically reinstated to the diplomatic corps. 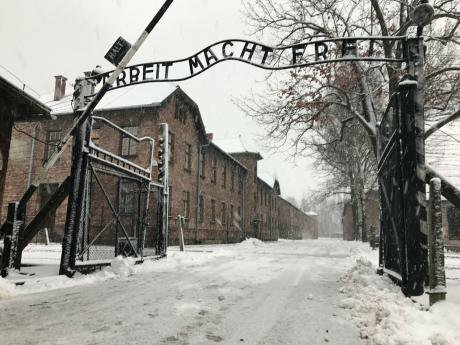 View of the entrance gates to Auschwitz in Poland. Jemma Crew/PA Wire/PA Images. All rights reserved. Aristides de Sousa Mendes courage and humanity was recognized before. In 1966, he was instated as a Righteous Among the Nations, a recognition awarded by the State of Israel for those who risked their lives to save Jews from Nazi persecution. His actions go however, beyond any religion, race or ideology. And are carried nowadays by all of those that perpetuate the struggle for human rights and human dignity. As the biggest refugee crisis since the Second World War unfolds in front of our eyes, we must think of them in today´s context. We must recall the Évian Conference – where the international community failed to reach an agreement on how to accommodate thousands of refugees fleeing persecution – and remember that what happened before is happening again. As thousands are dying every year in the Mediterranean, as the President of the United States himself has decided to ban people from several Muslim-majority countries, as a tragedy unfolds in Syria and Iraq, we should do more. We must do more. As the biggest refugee crisis since the Second World War unfolds in front of our eyes, we must think of them in today´s context. Aristides de Sousa Mendes, Marta Sharp, Witold Pilecki, Józef and Wiktoria Ulma, Oskar Schindler, Raoul Wallenberg and Nicholas Winton were some of the lights that shone through during one of the darkest periods in human history. Others are shining through right now. In rescue boats in the Mediterranean, in refugee camps in Syria and Iraq. States will end up honouring them, but for now, they keep forcing them to disobey in the name of justice. If you want to find out more, you can visit the Sousa Mendes Foundation website or its Facebook page.